A chance to reconnect with old friends, and make a few new ones. 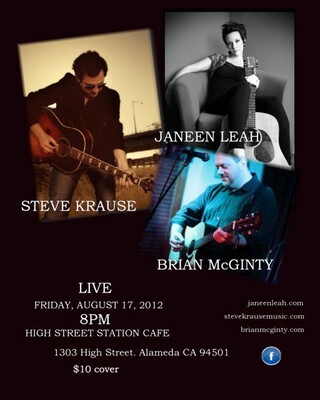 Bay Area favorites Janeen Leah and Steve Krause will be joined by Portland's Brian McGinty for an evening of acoustic music at the High Street Station Cafe in Alameda. Great food, great drinks, great songs. $10 cover. See you there! *ALL AGES* family friendly! !